Trump Faults Intelligence Chiefs As Break Widens Between Them The president complained that his chiefs of the intelligence services were too "passive" and "naive" after a Senate hearing that underscored how often the White House rejects their assessments. 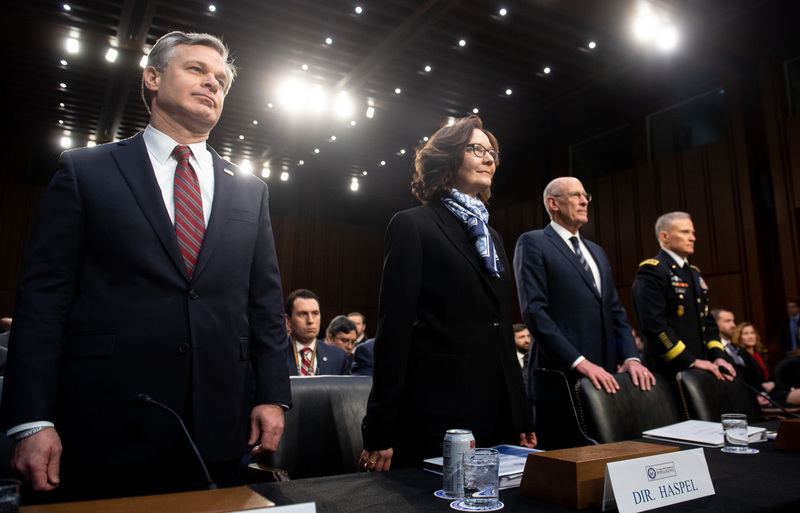 FBI Director Christopher Wray (from left), CIA Director Gina Haspel, Director of National Intelligence Dan Coats and Lt. Gen. Robert Ashley, director of the Defense Intelligence Agency, arrive to testify before the Senate intelligence committee on Capitol Hill on Tuesday. President Trump governs despite what his national security advisers tell him, and he doesn't care who knows it. Trump on Wednesday rejected testimony by his top intelligence chiefs in which they said that, among other things, Iran is still technically complying with the terms of the nuclear agreement from which he withdrew the United States. Comments like that by CIA Director Gina Haspel are "naive," and she and the other spy bosses are too "passive," the president tweeted Wednesday morning. Haspel and the other heads of the spy services "should go back to school!" he wrote. Haspel also said Iran's leadership is assessing whether it should continue to abide by the nuclear agreement — "we do see them debating among themselves as they've failed to realize the economic benefits they hoped for from the deal." She appeared with other top intelligence community leaders before the Senate intelligence committee on Tuesday. Trump's response on Wednesday followed a number of contradictions between the assessments of the national security establishment and the policies laid down by the White House. The Pentagon urged a longer commitment to the war in Syria in view of continued security threats from the Islamic State. Trump says that the terror group is defeated and that American forces would be pulling out. Director of National Intelligence Dan Coats said Tuesday that ISIS "will continue to be a threat to the United States." Coats said the intelligence community does not believe that North Korean leader Kim Jong Un will ever surrender his nuclear weapons because he sees them as essential to the survival of his regime. Nonetheless, the White House is negotiating another summit with Kim with the aim of "total denuclearization," as the president says. Trump mocked the idea of climate change this week as a cold snap chilled much of the Midwest. That followed a warning in the new National Intelligence Strategy about "influxes of migrants, refugees, and internally displaced persons fleeing conflict zones; areas of intense economic or other resource scarcity; and areas threatened by climate changes, infectious disease outbreaks, or transnational criminal organizations." Trump goes back and forth about what he accepts about foreign influence in U.S. elections, especially by Russia; Coats and the heads of the intelligence community told Congress that foreign powers not only interfered last year, but they'll also likely unveil new types of mischief in the 2020 race. The White House and the intelligence community even differ over which top administration officials should get access to secret information. FBI authorities recommended against awarding security a clearance to Trump's son-in-law and adviser Jared Kushner, but the White House overruled them because that authority stems from the president. In responding to a question about the clearance, FBI Director Christopher Wray summed up the situation in which the national security establishment finds itself: All it can do is present what it learns to the president, he said. Trump retains the privilege, as president, to take whatever action he wants. "We do not actually make recommendations one way or the other about the clearances," Wray said. "The decision about what to do based on those facts is entrusted by long-standing process to the requesting entity. So we provide the information, but then they make the call." House oversight committee Chairman Elijah Cummings, D-Md., has vowed to investigate the White House's security clearances practices following news reports about how they work. There are some areas of alignment. Trump has given many warnings about China, mostly about what he calls an unfair economic relationship with the United States, and the top intelligence chiefs echoed what they called that danger on Tuesday. China has robbed American companies of billions of dollars' worth of proprietary trade secrets, and Coats and his colleagues reaffirmed that Beijing's long-term goal is no less than supplanting the United States as the world's dominant power, however it can. "China's actions reflect a long-term strategy to achieve global superiority," Coats said. "Beijing's global ambition continues to restrict the personal freedoms of its citizens while strictly enforcing obedience to Chinese leadership with very few remaining checks on President Xi's [Jinping's] power." That's music to Trump's ears, politically, because it strengthens his case in dealing aggressively with Beijing on trade and other issues. And even on Iran, which Trump made the subject of his criticism on Wednesday, the heads of the intelligence agencies generally concur about the security threats it poses in the Middle East. Ballistic missiles, support for insurgent and terror groups, and other activities "underscore our concerns for a long-term trajectory of Iranian influence in the region and the risk of conflict escalation," Coats said on Tuesday. But there was nothing like that kind of ammunition available to Trump this week on the president's biggest single priority: building a permanent barrier between the United States and Mexico. Trump calls the situation along the Southern border a crisis and is evaluating the idea of declaring a formal emergency there under law, which would permit him to move around money without the approval of Congress to begin construction. However, at a Senate hearing dedicated to the "worldwide threats" facing the United States, the word "Mexico" was spoken exactly once, according to a transcript. Coats and his compatriots discussed the problems of transnational crime and the flow of drugs into the United States, but they did not say that — as he has in the past — warning lights are blinking red. Many members of Congress, including Republicans aligned with Trump, have tried to keep closer to orthodoxy on the major security issues facing the United States while still remaining supportive of Trump himself. South Carolina Sen. Lindsey Graham both faulted the president for ordering a military withdrawal from Syria and supports Trump's prospective declaration of an emergency in order to increase construction of a border barrier. And Senate Majority Leader Mitch McConnell, R-Ky., also stuck closely by Trump through the government shutdown this month over the border wall — albeit with something of a low profile — but at the same time made clear that he opposes removing American forces from Syria. Michael Morell, a former acting director of the CIA, said intelligence workers aren't playing a political game. For Democrats, Trump's criticism of the intelligence community on Wednesday followed what they've called a worrying, years-long pattern of willingness to simply discard the advice of specialists. Moreover, the insights that Coats and his colleagues have gleaned around the world come at the cost of significant effort, Senate intelligence committee Vice Chairman Mark Warner, D-Va., said on Wednesday. Coats acknowledged the heightened political environment during Tuesday's hearing and said he has tried to encourage intelligence professionals to focus on their work, not the criticism. "I want our people to get up in the morning and come to work thinking that this is what our job is, despite the swirl of politics that swirls around, not only in the Capitol but the world," Coats said. "Our mission is to keep our heads down. Our focus on the mission that we have to achieve in order to keep American people safe and our policymakers aware of what's happening."